Tokyo nights XIII, originally uploaded by manganite. One of my great inspirations on Flickr is a chap with the handle Manganite. I adore Tokyo and can't wait to return but Manganite's photos always tide me over until I land at Narita. The title of the above photo is "Tokyo nights XIII". There are many fantastic things about Tokyo and one of them is that it is truly one of the world's great cycling capitals. Japanese cities in general have great urban bike cultures far more advanced that any North American city can muster, so there is a load of inspiration to be found. What's more, Tokyoites are frightfully fashionable and chic. That, combined with bikes is - no surprise - something that tickles us pink. 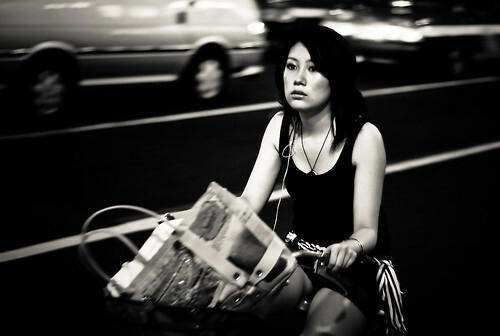 Manganite grasps so many of Tokyo's moods in his shots and it's high time we include a photo appropriate to this blog.